Major equipment player holds largest launch in its history. Truly going Big Green. Quantifying the scope of the latest launch from John Deere may be difficult. Do you start with the Machine Synch system that allows a single combine operator to manage the logistics of a field full of tractors pulling grain carts? Or how about a significant combine upgrade that includes the first new cab since 1989? Or maybe it’s the new 6R or 9R tractors. Essentially the company is holding its largest equipment launch in its 174-year history. The launch includes new 5 series utility tractors, 6R series row-crop tractors, 9R and 9RT high horsepower tractors, the new S Series combines, and there will be more surprises when the gates open next week. 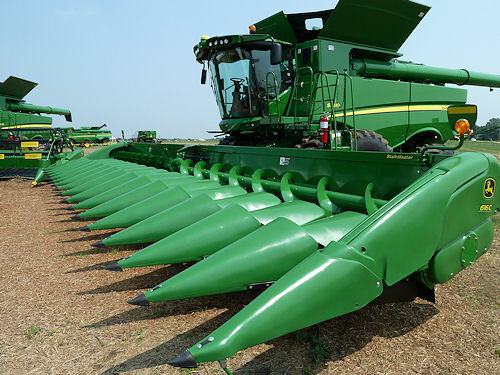 The new combine lineup got plenty of attention from dealers, but this year's John Deere launch is so big there will be plenty to discuss with customers well into the winter. It's difficult in a short space to tell the story of the all new equipment Deere is launching ahead of the Farm Progress Show. There was a theme throughout the introduction event that showed how John Deere equipment is incorporating new technologies including FarmSight. In the video on this page, John Lagemann, vice president, marketing, for the region that includes North America, outlines the significance of the entire launch. The new combines provide a peek into some of the highest-tech products the company is launching. S550 - a Class V machine with 271 horsepower. S660 - a Class VI machine with 320 hp. S670 - a Class VII machine with 373 hp. S680 - a Class VIII machine with 473 hp. S690 - a Class IX machine with 543 hp. Deere is launching its first Class IX combine with the S690, note the 16-row, 30-inch head it can power. There's also a new 40-foot draper header. Engines for the new line are all interim Tier 4 lower emissions engines that Deere says are cleaner burning that include higher horsepower across the line. The bigger machines will need the power to work with new draper headers and a big 16-row corn head. With that much grain going in, the new machines also feature a 33% increase in cleaning shoe capacity. The Variable Stream rotor is a new option that improves straw quality in rice and high-yielding grains with tough, dense straw. For the operator of the new S Series machines, the cab stands out. This big operator station, with the seat centered for comfort and improved visibility. The control console is expanded with new integrated screens - including an optional Green Star 3 screen that can offer you full control over a range of functions. And the cab even includes an integrated refrigerator for keeping your lunch, and cold drinks, cool. It's an interesting innovation for the machine. The new cab is 30% larger than its predecessor and is the first significant redesign of a combine cab for the company since 1989. But where the rubber meets the road, these machines can perform too. The new 9R series includes 5 wheeled R-series machines, three tracked RT models and power ranges from 360 hp to 560 hp. A new Efficiency Manager system can improve fuel economy by using computer power to throttle back and manage shift points during operation. The grain tank ranges up to 400 bushels per acre - for the S680 and S690 - and features an unloading auger that moves 3.8 bushels per second when unloading. The event started with a look at Machine Synch which provides that extended logistics for the combine operator. Once equipped with the right radios, the combine can interface with tractors and carts in a given field. The in-cab display even shows grain tank status, so cart operators will know when to pull up to the combine. Once a tractor driver pulls into a defined area by the combine, he or she takes their hands off the wheel as the system takes over. The tractor will then track the combine across the field automatically as grain is unloaded in the cart. When unloading ends, the tractor can be released and the driver can move off to take the grain away. The system will be available early in 2012. With the advent of new emissions standards, John Deere is reworking tractors too. The 9R - or 9000 series - will range from 360 to 560 horsepower and include five wheeled and three tracked models. And for the first time, the company is offering versions that can be outfitted with scrapers (that option is available in all but the smallest two machines the 360 hp 9360R and the 410 hp 9410R. The line gets the latest roomy cab, but there's more. Transmission choices include a 24-speed manual shift (only for the 9360R, 9410R and 9460R ag only - tractors) or an 18-speed power shift transmission. The 18-speed gearbox now includes the Efficiency Manager, a control system that when engaged allows the engine computer to keep the tractor moving at the speed you set, but vary the gear and engine speed for improved fuel efficiency. In a demonstration, running at full throttle (about 2,220) at 5 miles per hour, the tractor was burning about 13 gallons per hour. Engage Efficiency Manager, the throttle drops to between 1,400 and 1,600 rpm, maintains the 5 miles per hour and fuel use slides to less than 9 gallons per hour. This kind of technology was available with the infinitely variable transmission, but now can be had with the big-tractor power shift. The machines feature a range of other advancements including higher 3-point lift capacity, four selective control valves as standard and more. 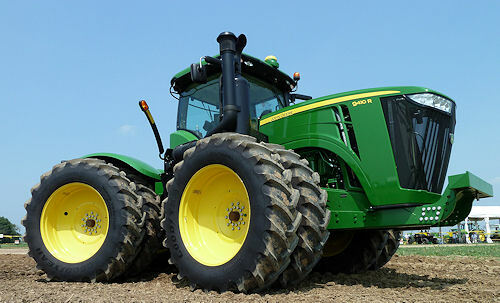 You can learn more about all the equipment being launched at www.JohnDeere.com.